More than 90% of the excess heat retained by heat-trapping gasses since 1955 has been stored in our oceans (1)​​. So knowing the impacts of climate change on land, imagine what it's doing to our oceans! One significant impact of ocean warming is coral bleaching. Coral bleaching is the expulsion of zooxanthellae (the algae part of corals) that lives on polyps (the animal part of corals) due to temperature change. This is called bleaching because the zooxanthellae are the part that provides the corals with color; without them, the coral appears white because you can see through the transparent polyps to the white calcium carbonate below. 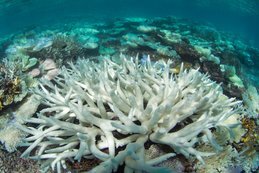 The ​main problem with coral bleaching, however, is not the change in appearance. Polyps and zooxanthellae live in a symbiotic relationship in which the zooxanthellae provide food through photosynthesis to the polyps. Without them, the polyps lose their major food source, and if they don't recover the zooxanthellae, the polyps die. In the current mass bleaching event, 93% of the Great Barrier Reef has been affected ​(2), destroying a vital habitat for thousands of species and a barrier against extreme weather. Another impact of ocean warming is abnormal migrations. Emerald parrot fish are native to coral reefs in the Caribbean and Latin America, where they eat plants growing on corals. However, due to climate change, the parrot fish are moving to colder areas. In 2006-2007, there were 22 times more emerald parrot fish in the Gulf of Mexico than in the 1970s (3). When they move to the colder kelp forests, they eat large amounts of kelp, instead of plants on the corals, causing other sea life, like crustaceans, sea otters, and gray whales that depend on kelp forests for habitat and/or food, to have to relocate to even colder water. Emerald parrot fish are just one example of many marine animals moving to colder areas because their original habitat is no longer suitable. There are many more, including phytoplankton, nudibranchs, and dolphins, and these are not just isolated instances. These relocations radically disrupt the food web, and, thus, oceanic and land life. The destruction of kelp forests, as shown in our previous example regarding parrot fish, directly affects humans by decreasing our supply of kelp products such as algin (a thickening agent) or by causing us to overharvest in less affected areas. It also indirectly affects humans through the depletion of various things, such as shellfish and rockfish, that we eat or use. ​This microsite was made by a member of Heirs To Our Oceans ​focusing on the impacts of climate change on our oceans. Heirs To Our Oceans is a group of youth ages 9-17 who are starting a global movement focusing on empowering all youth to increase awareness of the many problems facing our oceans and how they will affect our generation while pushing for solutions to those problems. If you liked this site or are interested in other ocean issues like plastic pollution, ocean acidification, and cetacean captivity, please check us out at heirstoouroceans.com and on social media below.